behind your display space, and the spectator walkway in front of your paid space must be kept clear. 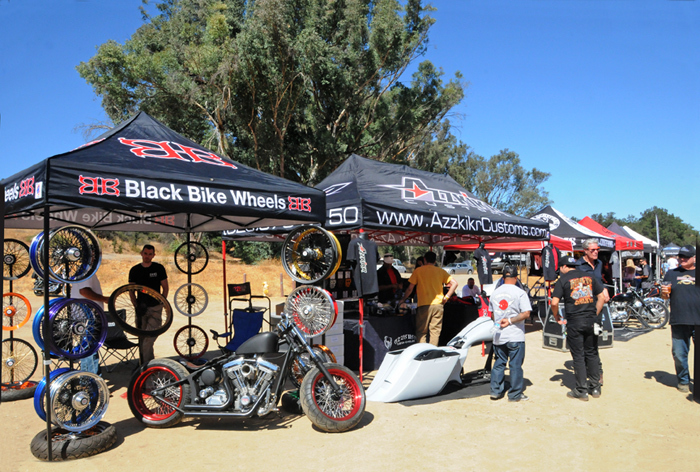 Purchase 2018 Admission Tickets, Bike Contest and Exhibitor Space HERE! Space is limited and will sell out, So Don't Delay. Motorcycle Parking is Free. Advance Ticket Sales are Non-Refundable. Returning Exhibitors, Sponsors, Calendar Bike Builders, Exhibitors with special interest displays and attractive spokes models always receive preferential location consideration so the Show looks good, making spectators stay longer and return again next year. We also alternate similar Exhibitors to keep competitors apart, and place interesting Exhibitors to create a balanced flow of spectators for everyone's benefit. In the Email you send us, you can request preferential location placement. Examples: Same Great Spot as Last Year! Spokesmodel Angelina Jolie Signing Posters! Next to our bike painter Sloppy Bob! Big Rig or Display Trailer which needs to be in place the day before. Exhibitor Packs / Passes / Vender Layout Maps will be signed for In Person at the Back Gate during Vender Set-Up Times. Show Exhibitor Map:. We place you based on your request on the Registration Form, your Seniority with us, and where we feel it is best for spectator flow and the quality of the Show. Sponsorships & Special Activities - If your company would like to be involved as a sponsor of the Show, of the Calendar Bike Building Championship, or perhaps have a special activity for our Attendees, please reach us with the contact information at the bottom of this page, or GO HERE. • Exhibitor Location will be given to you at Back Gate Check-in. will be placed just in front of the Event Lawn Front Entrance Gate on the access road. Reservations required for Saturday setup. Vehicle access inside the event lawn is limited. No trailers will be allowed in to unload inside the Event Grounds on Sunday morning 7:00-9:00am. • Small Exhibitor pull-in and parking Sunday, Show Morning Saturday Morning 9:00-10:00am. Vehicle access is limited. No Towed Trailers allowed. Event opens at 10am. Late arrivals after 8:30am Sunday may have their booth space relocated to another location to facilitate event setup. No Vehicle entry after 8:30am. Call us to discuss any special access needs. • Exhibitor Parking Is located off the access road, north of the Event Lawn. Please do not take up close spectator parking. • Show Open to Public 11am-5pm SSunday. No Exhibitor Breakdown or Bike Exit until after Show closing 5pm Sunday. • Exhibitor Take-Down Only after Show closing on Saturday at 5pm. You will be responsible for clean-up of your space. •Your Exhibit Space/Booth should be self contained / free standing You are located outdoors on grass or paved asphalt in the sun. You may want a canopy, hard pads for bike kickstands and centerstands. No Electrical or phone hook-ups are available. • You Can Not Extend Out of Your Paid Space - Trailer Hitches, Tow Bars, Ramps and Opening Doors must fit and open in your paid space. Other exhibitors may be located directly to your sides / rear, with fire lane/walkways in front. Bring partitions if needed. You can not extend into walkways. • Business License Not Required for Display only or Mial Orders. Carry-Out Retail Sales require payment of a $50 State park Busiess License. Refund Policy: Payment in full required to reserve your space. 80% refund if you cancel before June 1st, after which no refund. No refund if the event does not take place due to circumstances beyond our control including weather, an act of god, or cancellation by a government agency. We reserve the right to refund your registration should we reach capacity and have another exhibitor more appropriate to the Show theme. No refund if you do not fit in your paid space and are removed. • No Electrical Power or Phone hook-ups are available. (Note: there are elecrical hook-ups in some areas. This is a grass park and asphalt areas. Your exhibit needs to be self sufficient. We will send you an Email Confirmation within 2 weeks of receiving your Registration Form in the mail, and/or you will be listed as a Confirmed Exhibitor here on the main Bike Show page. Please include your Email address on your Exhibitor's Registration Form so we can contact you and confirm receipt of your Registration Form and Payment. You Exhibitor Map & Passes will be Picked Up at the Front gateGate during posted Exhibitor Setup Times. Exhibitor layout maps showing your placement at the Show will be posted here online around July 7th. You will receive (1) Worker Wrist Bands for admission for your first 10' x 10' paid space, then (1) additional Worker Pass for each additional 10 x 10' space purchased up top 5 Free Passes. (Example: 20 x 20' space/ 4 spaces = 4 passes). Additional Passes will be cost normal Spectaor Admision Prices. Exhibitor Map and Staff Passes will be collected and signed for in person at Exhibitor Check-In at the Exhibitor Back Gate before 10 am Sunday. 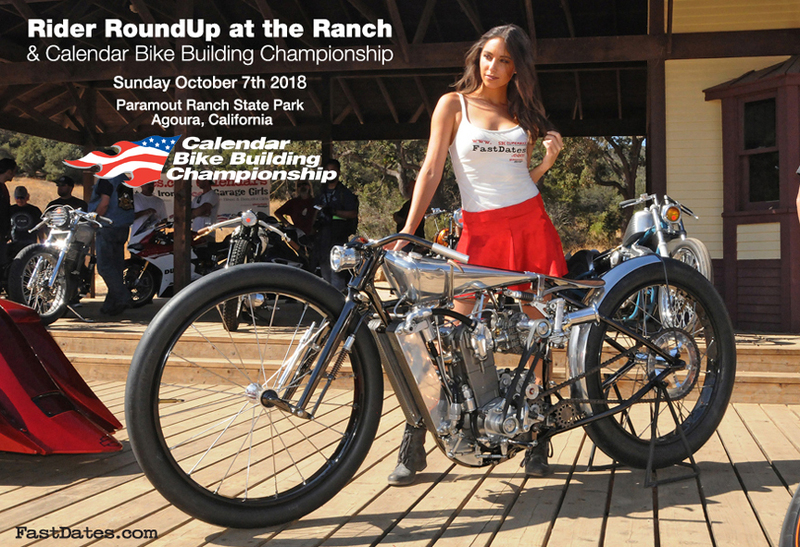 • You can also be the Title Sponsors of the Fast Dates World Superbike, Iron & Lace Custom Bike, or Garage Girls PinUp Calendar for just $1,500 additional, which includes your logo / web address on the Cover and each Page / Month of the 16-page calednar , plus a 12-page d in the Calendar. • You can also be the Title Sponsors of the Fast Dates World Superbike, Iron & Lace Custom Bike, or Garage Girls PinUp Calendar for just $1,500 additional, which includes your logo / web address on the Cover and each Page / Month of the 16-page calendar , plus a 12-page ad in the Calendar and a 1=page a in th FAST Calendar Magazine.